The attraction opened on June 23, 1963 and was the first to feature Audio-Animatronics, a WED Enterprises patented invention. The attraction's first commercial sponsor was United Airlines but sponsorship soon passed over to Hawaii's Dole Food Company who remains the sponsor to the present day. Dole also provides the unique Dole Whip soft-serve frozen dessert sold at a snack bar near the entrance. The attraction was at first separated from Disneyland insofar as Walt Disney personally owned it through his own company, WED Enterprises, instead of the rest of Disneyland which was and still is owned by the Walt Disney Company (then Walt Disney Productions). The show was originally going to be a restaurant featuring Audio-Animatronic birds serenading guests as they ate and drank. The "magic fountain" at the room's center was originally planned as a coffee station (there is still a storage compartment within the base of the fountain) and the restaurant would have shared its kitchen with the now-defunct Tahitian Terrace in Adventureland and the Plaza Pavilion restaurant at the corner of Main Street, U.S.A. since all three are actually part of the same building. Since ownership of the attraction was separate from the rest of the park, a nominal admission charge of $0.75 was levied. 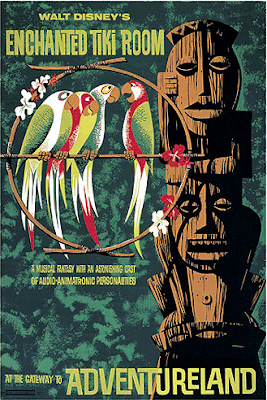 Since computers have played a central role in the attraction since its inception, Walt Disney's Enchanted Tiki Room was also Disneyland's first fully air-conditioned building. The attraction opened in an era when all things Polynesian were popular and was an immediate hit. It houses a Hawaiian-themed musical show "hosted" by four lifelike macaws whose plumage matches their implied countries of origin. "José" is red, white and green and speaks with a Mexican accent, voiced by Wally Boag; "Michael" is white and green with an Irish brogue, voiced by Fulton Burley; "Pierre" is red, white, blue and has a French accent courtesy of the voice talents of Ernie Newton while red, black and white "Fritz" has a German accent provided by Thurl Ravenscroft, who also voices Hawaiian god "Tangaroa" near the attraction's entrance. The four macaws as well as all the other birds are plumed with real feathers with the exception of chest plumage. The chests are covered in custom-woven cashmere which allows the figures to "breathe" in a lifelike manner. The choice came quite by accident; in a planning meeting, Harriet Burns noticed a cashmere sweater that Walt Disney was wearing which moved at the elbows exactly the way the engineers envisioned.